For the second time in a week, president-elect Donald Trump has abandoned precedent and traveled without the "press pool," a small group of journalists assigned to cover his movements. The move Tuesday night has spurred a strong backlash. "It is unacceptable for the next president of the United States to travel without a regular pool to record his movements and inform the public about his whereabouts," the White House Correspondents Association said in response. "Pool reporters are in place in New York to cover the president-elect as he assembles his new administration. It is critical that they be allowed to do their jobs," the association's president, Jeff Mason, said in a statement. The press pool exists because Americans have a right to know about the president's whereabouts, particularly in a turbulent world. Trump's press secretary, Hope Hicks, told journalists around 6:15 p.m. Tuesday that there was a "lid" for the night -- a term of art meaning that no more news or travel was expected until Wednesday. Trump has been at Trump Tower for several days and has not been seen in public. Later in the evening, however, Trump took his family to a nearby restaurant, the 21 Club, for dinner. The press pool would have been ready to travel with him, but they were not notified. A Bloomberg staffer dining at the restaurant spotted Trump and tweeted a picture, sending journalists scrambling to catch up. While Trump and his aides may delight in irritating journalists, the behavior breaks with well-established norms governing a president's relationship with the press corps. Those same norms are also applicable to the president-elect. It doesn't matter whether Trump ordered the caesar salad or the strip steak. 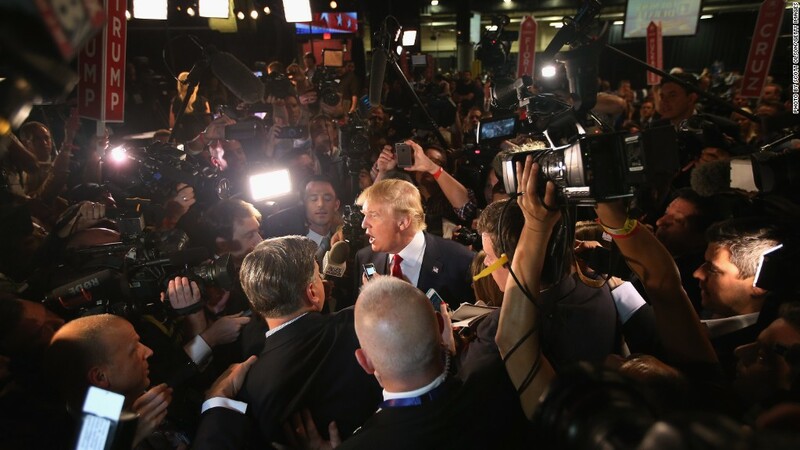 Journalists were not seeking a seat at the dinner table with Trump. Normally reporter wait in a separate room or in a vehicle. The press pool matters because everything the leader of the free world does matters. While presidents often agitate for more privacy and freedom, and occasionally slip the press, the pool of journalists is a fixture of Secret Service motorcades. In an emergency, the journalists quickly relay information, helping the president and his aides inform and reassure Americans. This was vital on 9/11, for example. On a day-to-day basis, the journalists keep track of the president's whereabouts and how he spends his time -- useful information for the voters who elected him and the voters who did not. What Americans know about George W. Bush's trips to his ranch and Barack Obama's golf outings is thanks to the press corps. "Questioning the necessity of press pool means questioning the public's right to know president/president elect's whereabouts, meetings, etc," Julie Pace of the Associated Press tweeted. The reporters and camera crews view themselves as a "conduit to the American people, so that everybody in the nation knows where he is," NBC's Hallie Jackson said on MSNBC Tuesday night. Jackson quickly made a reservation at the 21 Club so that she could verify Trump was there. She said he was seated in the main dining room with his family. Former Bush administration press secretary Ari Fleischer wrote on Twitter that Trump's aides should have told the press corps where the president-elect was going, following normal protocol. "A press van would normally be included in the motorcade," he wrote. So what went wrong? Hicks told journalists that she did not know about Trump's travel plans. She reiterated what she said last week after Trump traveled to Washington, D.C. without a press pool -- that the normal set-up will be put in place soon. CNN's Sara Murray told Anderson Cooper on Tuesday night that this "appears to be yet another misunderstanding of exactly how much gravity his new title as president-elect holds. If something, God forbid, were to happen to him, that's a matter not only of public record but also a matter of national security, given that he is next in line to take the White House."